Surveillance image of the suspects in an armed robbery at a Bolingbrook 7-11. BOLINGBROOK, Ill. (WLS) -- A 7-Eleven in southwest suburban Bolingbrook was robbed by five armed suspects Saturday morning, police said. Police responded to the 7-Eleven at 398 S. Schmidt Road at about 2:40 a.m. after a report of an armed robbery, police said. Five male suspects, aged 17-24, entered the store armed with handguns and demanded the clerk open the registers, police said. The suspects took cash and cigarettes and one punched the clerk before fleeing in a black four-door sedan. 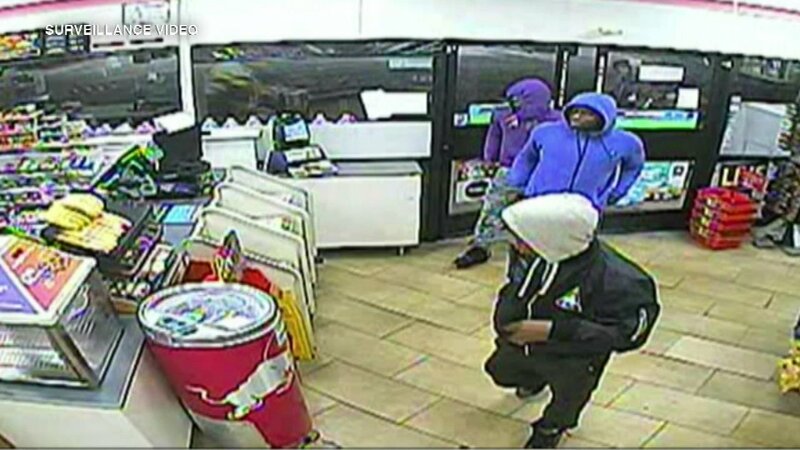 Surveillance image of suspects in an armed robbery at a Bolingbrook 7-11. The clerk was able to flee the store and call police. He did not require medical attention, police said. The clerk's family said he had been working at the 7-Eleven for a week. Some of what was stolen was later recovered by evidence teams in the 7-Eleven's parking lot, police said.